I’ve spent the last two weeks traveling around the south coast of England—Cornwall, Devon, and Dorset, and now I am ensconced in Eton, home of the boys’ boarding school of the same name that was founded in the 15th Century by Henry VI. I’ve visited so many quaint little seaside towns, shopped in so many independent stores, and supped in so many Ye Olde Tyme pubs that I’ve lost track. But all this is to say that it makes me sad that people come to the UK and never leave London. They say London is a country all its own, and that’s probably true. But there’s so much more to Britain than London. And that’s true of the Netherlands, too. Most people only ever visit Amsterdam. They wander around the red light district (tee hee), take pictures of the canals and all the bicyclists, smoke some pot in a “coffee shop,” and go see the old masters at the Rijksmuseum. I feel really fortunate that I had my personal guide and good friend Ingrid to show me around. As I wrote in my last post, she lives in Utrecht, a sizeable university town about 45 minutes from Amsterdam. Probably everything in the Netherlands is about 45 minutes from Amsterdam. My first night there, I was awake late because it was light out until 11pm. Then I woke early because it got light at around 4am. Besides, I was excited about the day ahead, which Ingrid had promised would involve bicycling in a national park. We drove about 45 minutes to Park De Hoge Veluwe. I am no great judge of space but it had to be larger than Central Park in New York. We parked the car near the entrance, bought our tickets, and picked out bikes in the bike lot. The bikes were all white, all had child seats, and they were free. There were no helmets or locks in sight. The great thing about biking in the Netherlands is, it’s so flat. Therefore it was no need for more than one gear, since the biggest hill wouldn’t cause you to break a sweat even if you were totally out of shape. The weather is also mild, so no sweating. I loved it, biking along on a beautiful summer day in the wild with a good friend. 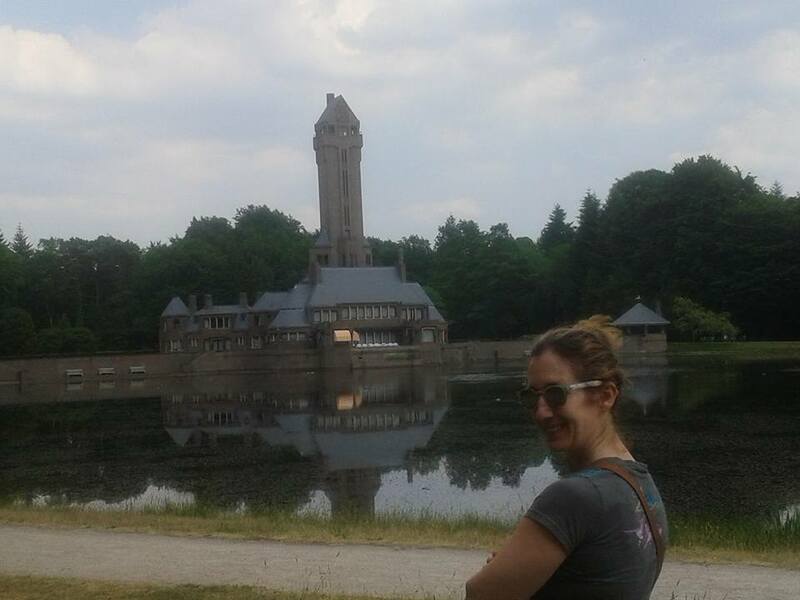 We arrived at our first destination, the St.Hubertus Jachthuis, a hunting lodge built by the Dutch architect H. P. Berlage in 1915 for a German couple, the Kröller-Müllers, with money pilfered from her father’s company. Hmmm … it reminds me of something …. The lake is artificial; the first iteration drained because they hadn’t realized it was sandy soil underneath. Inside, Berlage had created a unitary design—from floor to ceiling and everything in between, the furniture, carpets, art, light fixtures, etc. were designed as a single work of art. It was never meant to be lived in, but to be a monument to his genius. Frau Müller had other plans, fired him, and lived out her days here. 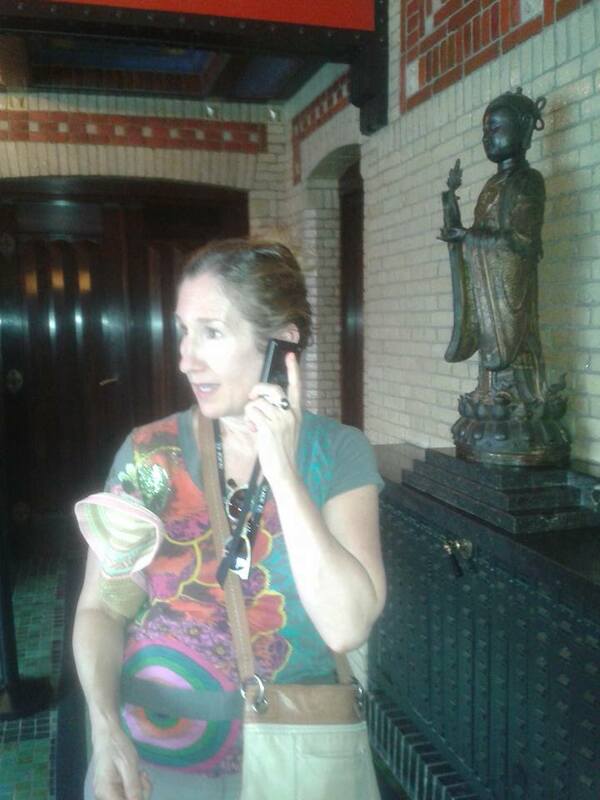 Ingrid joined a group of Dutch tourists with a Dutch guide, while I listened to an English tour on a handset. The English version would finish, then the Dutch docent would talk on and on for another 15 minutes before we moved on to the next room. Was it because Dutch words are so long? No, I learned afterwards, it was because the Dutch guide was telling the group a lot of bonus tidbits, like that Frau Müller had a young male “companion” on whom she lavished attention. After the tour, we biked to the Kröller-Müller Museum. Frau Müller was an art hound, and luckily for us she used a lot of the money embezzled from her family company to buy art. The museum had an incredible collection of van Goghs, most of which I had never seen. It held lots of other famous painters too, but annoyingly it closed at 5:00 and its surrounding sculpture garden closed at 4:30. Why? It was summer. It was light out until 11. We arrived at 4:15, made a beeline for the van Goghs, and only saw the rest in passing. 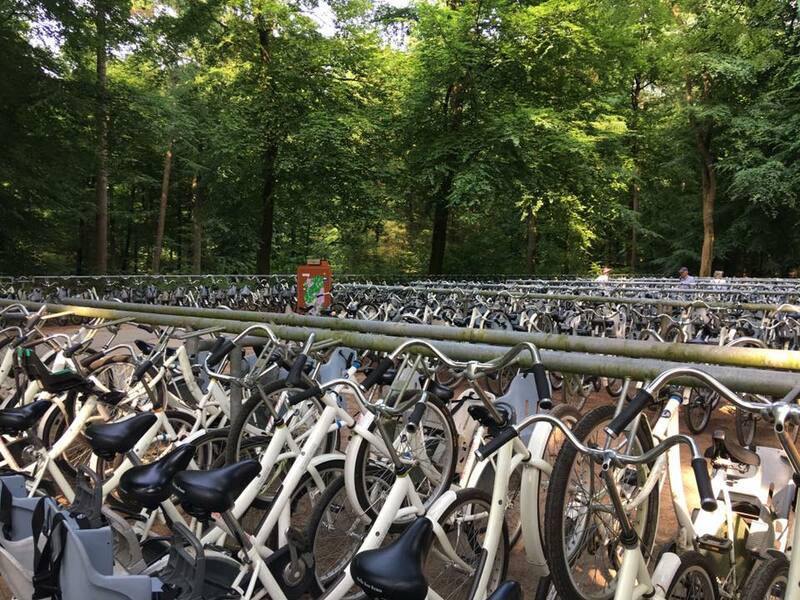 This entry was posted in Adventure, Budget travel, Culture shock, Joie de vivre, Living abroad, Travel and tagged Holland, The Netherlands, travel on June 30, 2017 by Breaking Free.